The Late Cretaceous 144 - 99 million years ago, is the final era of the Mesozoic. Also refered to as the Upper Cretaceous. Commonly divided into six stages. The first four are the Cenomanian, Turonian, Coniacian and Santonian. Flowering plants are wide spread in the the northern continents of Laurasia. This is the most diverse period for dinosaurs. The best known sites are from North America and Asia,This diversity peaks in the North American Campanian, the 5th stage, with the Judith River fauna. Originally portrayed as sluggish dull creatures in the 1950's figures ,dinosaurs are now created in active poses with colorful skins. There is still an audience and nostalgia for the classic dinosaur art of Zallinger, Burien and Knight. 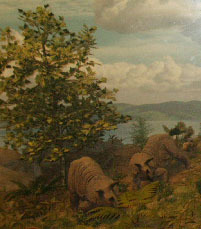 Final stage of the Cretaceous is the Maastrictian. The Early Maastrictian is represented by the Kirtlandand Horse Shoe faunas. By this time flower plants are the major players in the world. In China desert environments like Flaming Clifts and Ukhaa Tolgod perserve the smaller faunas. 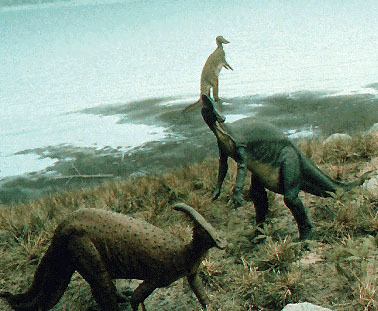 Therizinosaurs are unique plant eaters. The last of the dinosaurs are know from the Hell Creek formation in North America famous for Tyrannosaurs and Triceratops. There is some debate about how representative this is of the dinosaurs world wide. In the south Gondwana South America follows a different path. Reptiles continued to rule in the Cretaceous Seas and Pteranodons fly the Mesozoic Skies until the end of the Cretaceous.